In a scenario, reminiscent of the release of a top-end supercar, demand for the yet-to-be-officially-released Rayglass 3500 has been every bit as strong as anticipated. “Following extensive market research, we had a clear understanding of the markets requirements, knowing Kiwi boat owners were eagerly awaiting our new, Rayglass 3500” says Rayglass Boats CEO Dave Larsen. Rayglass’s new 3500 and the company’s sustainable growth has seen a need to create new production facilities to cope with the increased demand. “The new Rayglass 3500 is a sophisticated modern take on the much loved traditional Kiwi sedan cruiser,” says Scott Little, Rayglass Boats Sales Director. “It has a wide appeal with the buyers being a mix of professionals, couples with young families and those looking for a Sports fishing launch. Scott Little believes unique production techniques, developed especially for the Rayglass 3500, are a big part of the new model’s appeal. There are also spacious master and guest cabins and separate shower and toilet areas. “We are extremely excited about the future of the 3500 and positive we will achieve what we set out to do – provide our customers with a value for money world class product”. 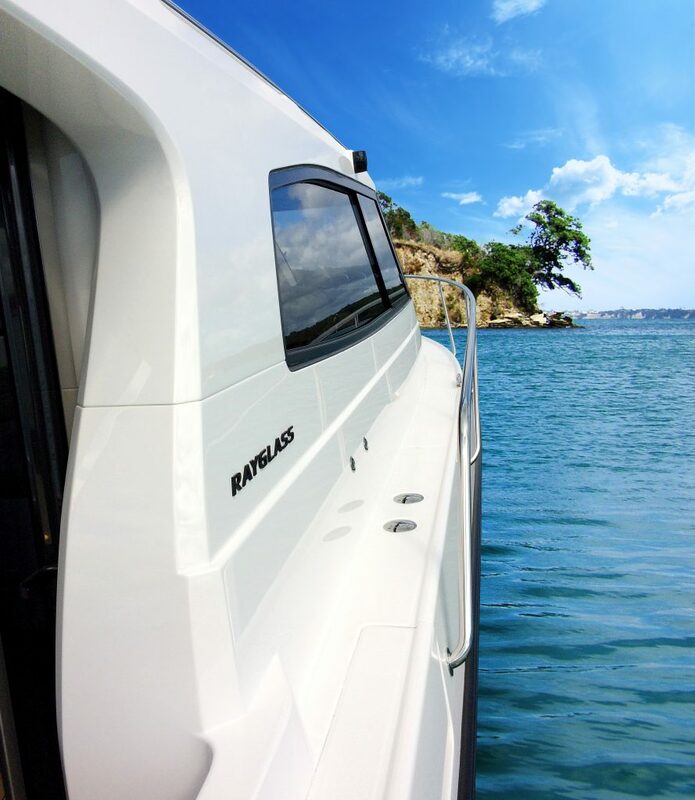 “As soon as a new boat comes off the production line, the proud new owners, understandably, want it in the water and away enjoying themselves aboard their new Rayglass 3500”.